I have a question, that I think I have already answered. How do you know when it is time to do laundry. I'll give you 5 good reasons! 2..When it does not let you out the front door...especially if you're in a hurry. 3..When the whole family has run out of under wear. 4..When everyone is also running out of clothes. 5..When you have to wash hubbys' jeans and work shirt in bathtub. This is not Ripley's Believe it or not and it is not my Tackle it Tuesday. This is my normal or shall I say abnormal life..coming and going. From in front to behind...way behind! Since we don't have a washer, we have to go to the laundromat. Since we are going to use tommorrow as a 'everybody- pitch- in- and- clean- the- house- and- afterwards- go- to -the- park- day'! I didn't want to use the cleaning house time with having to go out and do laundry. So I did it today while Hubby was at work. There have been a few times I have taken all 4 kiddos to do laundry with me alone. There is a reason why it has only been a few time. My kids.....and probablly everyones, seem to think the laundromat is an amusement park. Oh, if life were only so simple and carefree again! No! Those carts are not for riding/climbing/racing or even quietly sitting in! No! You may not eat that gummy worm you found on the floor even though we apply the 10 second rule at home...you have no idea how long it's been on the floor in this fine establishment! No! I will not buy you a soda or candy from the machine even though it is the gazzilionth and 1 time you have asked me! No! We are not leaving soon because I only just loaded 5 of the 10 loads into the wash! So pretty much all of this is accurate, ok, maybe not the gazzilionth thing. It was probably like only the hundreth time. So this time I got smart..sort of. It is something I am striving towards in life. The Dollar Store is really close to our laundromat (yes it is ours because we go there so often). So I decided to buy each of the kids a cheapo toy. My sanity at the Laundromat----Priceless! Yes it worked! They walked and talked and colored and shmoozed chips off another kid and colored and were mostly pleasant for the 2 1/2 hours it took me to wash the 10 loads....yes it was actually 10 beacause 2 twin comforters needed washing! Also, because it was around lunch time, their only 'food' was some cheapo sodas I bought from the cheapo store and some chips we had at home...pretty sad. But they were happy! Am I tired? Yes! Was it worth it? Yes! Will I do it again? Ugh! Yeah...only cause I have to. So wish me luck tommorow on our "Day of Purging the House"! And once again restore order. Soon I will celebrate freedom...from my house! 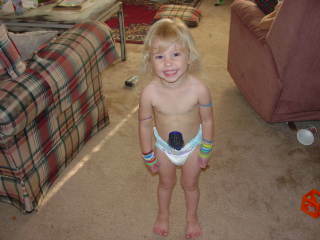 That is a hairbrush tucked into her diaper! And hairbands on the arm! Diapers are good for more than poopin'! They can double as a utility belt...cool! Ok...so here goes! I have been inspired by my friend Michelle. I never realized how similar our dressers were. I figured if I posted then I would HAVE to get it done! Thanks Michelle for your inspiration. 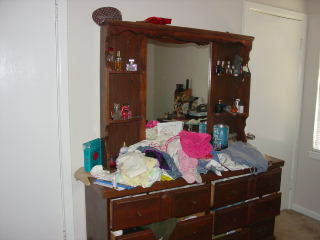 This dressers keeps getting worse and worse. Actually it is the room that needs fixing but lets just focus on one thing at a time. And because this is what we see when we sit/lay in bed (it is opposite the bed). It is an important focal point. So check back later...tonight probably, to see how I have done. *Spit* on palms*Rub*! Here I gooooo!! Wooohoo! Smell that pledge! 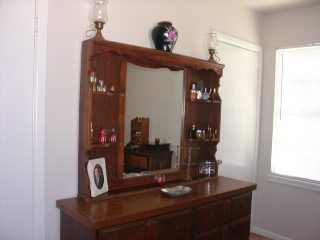 Hey ladies do I get bonus points for straightening my Hubby's little dresser that can be seen in the mirror refection? I sure think so! Whew and I even have time to go start dinner before he gets home...sweet! I just posted last night that I couldn't figure out how to change my slide from a post to a header. But now I have to change that post because I just figured it out...yay for me! You may have noticed I keep changing my template. I just get so bored so fast with the choices I have. So black just seems to be the choice. I like black cause it goes with everything! Trying to figure out all the technological stuff has been 'over my head'! I try to make my blog do what I want but it doesn't always listen and obey. 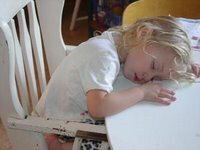 Gosh...I have enough difficulty with my children, I don't have to take this from blogger! Well I am proud of myself for figuring it out and it wasn't as hard as I thought. Well, I'll go back to putting my clothes away...again! Here is my 'Alice' (2 1/2 to the right) as my friend Michelle calls her! This is not with the hair cut. But I will get that pic' up a.s.a.p. But this was a mid-day catnap! Sometimes you just have to stop whatever you're doing and sleep! This is my littlest monkey (1 yr old to the left) 'Little Bee'. She does buzz around the house all day and keeps me and her siblings busy picking up her messes. Right now I don't have the time or patience to get her to pick up her own messes. I am all for training but half the time I don't know if she made the mess or my 'Alice' did. 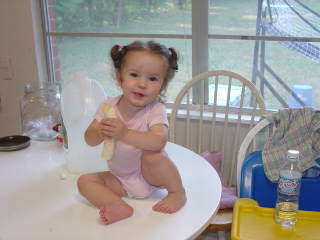 In this pick she got herself out of her seat, where she was buckled and climbed onto the table! Don't worry, it has a very and strong base. 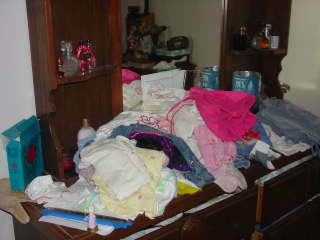 Besides, she is very lightWell, I am still getting my laundry put a away from my laundry day last week. That is bad! I have moved one pile of laundry a few times. There has GOT to be a mom out there that can empathize with me. Please tell me you understand! I have been taking my kids to VBS this week and they are loving it! I had thought I would come home and get some stuff done around the house...yeah right! Get more done without my older kids help with the 2 younger ones? Well 2 other moms and I have decided to take our little ones places and let them have a little fun while we visit i.e. play area at mall and museum...etc. I have been able to get more done when I come home too. Weird, huh? I think it has to do with the structure in the day. Whatever works! I am realizing that I either don't have an exciting enough life to blog often enough or I am too darn busy to be able to post a blog. Oh, how I want to post more often and to make my blog-site more purty, but alas, I am "over my head"! Ok..so here it is! 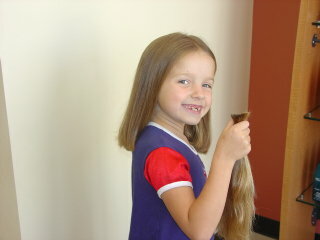 My eldest daughter 'sal' and I have discussed her getting her hair cut and donating her hair more than a year ago. Well the other day we saw a post about a girl who had donated her hair to Locks of Love . So, we did it! Ok, she did it! As a mom I feel it is one of the most noble things a child can do. I am very proud of her. It has been way too hot here anyway (it has been in the 90's consistently for too long) And the haircut was free at Fantastic Sam's, because it was donated! Cool, huh? Personally, I think the short hair makes her look so mature, but she's only 8. They cut a whole 10 inches! She has decided to do this every summer. Let it grow long in the winter and cut it short and donate it in the summer. I think I have been just as excited as she has been about the whole thing. Well we also had my husband and my son's hair cut at the same time. My son who is 6 does not want to spike his hair or comb it to the side. He wants it short and combed straight forward. That kind of Cesar looking style...uugh! I cannot convince him or bribe him otherwise, darn it! I thought my 2 1/2 year old would fuss and want to get hers cut too. But she didn't say anything. Maybe the bowl of lolipops kept her occupied. My son and her promptly finagled one from the lady at the counter. Anyway it finally happened. 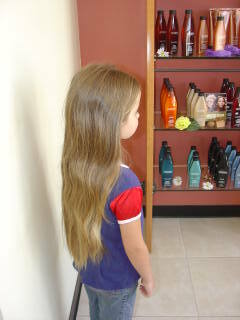 She had been internalizing her desire for a hair cut. Today she did it...'the chop' ..... herself! She has such pretty blond curly hair and she wacked off a good chunk just above her bangs! She has left remaining a tiny, very tiny bit of bangs left, so I will attempt a 'comb over/back' for how many weeks?! So the really bad thing about it was that I was only about a foot or so away when it happened! Where the heck was I?! Now I know this has not happened to any of you moms! I was so...'Oh My Gosh, Oh Honey, What! Why?!' and she was so' I'm sorry mommy'.......Sigh..... 'I forgive you sweetie'.... So, almost everyone in the family got haircuts this weekend some good, some bad and some ugly...hee..hee...not really, they are all beauties! Well here it is..however humble it may be. I did tackle my laundry today. It was a big pile in the bathroom closet, 2 big tubs and a (twin) blanket,mesh bag, some sheets and a small couch pillow (cause my boy ate cereal on it and spilled milk)! I took my kids to their friends house and I took the laundry to the laundromat. After like 3 -4 hours and I think 6-7 loads and maybe $10. I went to get my kids and had clean laundry in the back of the van. I can't remember how long it was or how many loads or even how much it was. I feel like I went to war with the dirty laundry and it won. So now I'm home with the clean laundry and I'm staring it down. I'm trying to convince it to go too bed. But it keeps telling me I should go first. So here I sit blogging and my husband comes along and asks is I got my resume sent like I said I was going to do. How do I get so distracted? Why didn't God make more hours in the day. Hmmm....maybe cause I'm having a hard time organizing the time I already have. Hey, I'm a work in progress, aen't we all?! I have taken some before pic's but I'm not posting them yet. I'll save them for later. Ok...I am becoming the lazy blogger. I'm just going to throw this blog out there so I don't get so far behind that someone worries that I'm gone for good. In our whole job thing/lack of income/Lord help us journey, I have decided to put in my resume at some of the magnet schools in my area. This would mean interpreting for deaf students at hearing schools (basically). I have not worked in like a decade. That is a really long time. I have never had a resume before! I worked in fast food and as a stocker! The only thing qualifying me for a job as an interpreter is that I've been a missionary to the deaf for the past 12 years. So I guess that will have to do. I got the idea to check into this specific possibility from a creditor, funny ,huh? I had been asking the Lord to show me the direction He would want for me and our family. I believe He is doing that. He has been providing for us on a day to day basis. He is good- all the time! I have some nice pictures to share but I don't have time to put them up right now. Oh and I don't think I'll be able to do my Tackle it Tuesday either. Actually....I'll be tackling my laundry at the Laundromat! So there! But the things I took pictures of will not be posted because they are not finished! That will happen later....Really. I am hearing the Hallelujah chorus of "Handel's Messiah"! Why? Because, I have accomplished so very much today, in spite of my slacker-disorganized-4kidsdriving me crazy-need coffee condition that I am in! I really wish I had taken a picture of before and after. I did not know about the Tackle it Tuesday, but I am SO signing up! There are still areas to be tackled, don't worry. You may yet get a peak inside the "House of Horrors!" Ok, I have to confess yet again that my hubby came to my rescue. And really the driving force behind me getting so much accomplished today was the fact that I was supposed to have a Usborne books home show today at my house. But guess what? No one showed! Isn't that awful! Well it was not a complete loss. NO! Cause it pushed my buns into action. So about my hubby, after work he helped finish the kids room. Well we were pressing for time. So while I was washing my hair in the kitchen sink, he was literally raking with his hands all the stuff that was on the floor. (yeah I think that may be cheating but it got the job done for the moment). He put it in a box for me to go through tommorrow...hee..hee! Maybe I'll just save those for next Tckle it Tuesday! Sounds good to me...there go those slacker tendencies. To bad no one is perfect. Well because I am motivated visually, being able to see the floor really helps me to do so much more! Oooh, I also want to mention that my Usborne e-show will stay open for another week. So ya'll may visit and buy any time you like! First off, I know I don't get to blog as much as I'd like to and then when I am bloggin' I feel like I'm on too much...huh? Anyone else with this problem? Ok, So now I want to brag cause I have the best husband and I feel badly for the rest of ya'll who only got second best...hee..hee! My husband loves to cook and cooks well! I know my friend Michelle will atest to that. If there is no bread and we are broke (which has been the case for far too long), he won't do without bread if he has a hankerin' for bread. He'll just make it! And I ain't talking bread machine or any ready made box either. He goes all out from scratch. And there is nothing and I mean nothing like fresh out of the oven white bread with butter on it! Mmmm..Mmmm..good! Ok, now I'm making myself hugry. I know I'm starting to make myself sound like a slacker wife, but I'm ok with that. If my husband loves to cook, why mess with a good thing. So why does he say the kitchen and also the house are mine, that I am the queen? Well, I guess cause he loves me. Tonight I went to church and took the kids and he did not go because he had got on a 'roll' (not the bread kind) in the kitchen and didn't want to stop. I know I mentioned befoe that we recently moved to Texas. Well with the kids we don't settle in too fast. Honestly I think we are doing very well but things quickly get out of sorts. Well they get that way without us moving. So, back to braggin', when I get home and put the youngins' to bed I go to the kitchen and he is on his hands and knees scrubbing the floor! Yeah, now yer jelous! Ok so this doesn't happen often, actually it hasn't happened before. 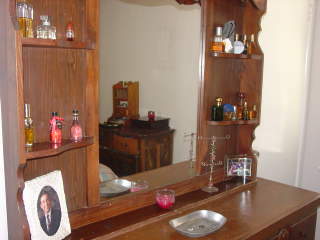 But last week we worked on our bedroom together and got it looking more 'friendly' and inviting (meaning organized). It is looking good! Little at a time. On another note...I appreciate you prayers, we continue to live one day at a time. God is taking care of us day by day. There are still a tremendous amount of needs that we have (rent, utilities, car payment...etc) Food needs have been provided in the form of food stamps and WIC and we are applying for medicaid. There is not much we can do but prayand ask for prayers. If I hadn't mentioned it before, my husband is working for the seminary where he will be returning in the fall, and they pay a very small wage. He is hard of hearing too so that limits some jobs possibilities. We are praying that God not only provides the finances we need but also the job that God would have for him. He likes his job and it is close to home but we are praying and have been looking for a second job. Wanting to know if that is what God would have him to do. I ahve decided to give all my worries to God. He clothed the lilies of the fields and feeds the sparrows. How much more does He love me, a child of the King? .....Alot! That is how much He loves all of us! Thanks again for your precious prayers!